If you are looking for a nice cafe to take a break from all the walking around in Kyoto, why don’t you have the cat cafe experience? Cat cafe is a themed coffee shop, popularized in Japan, where you get to play with cats. You usually pay a cover charge then you get to admire and play with fluffy friends. Watch out though cafes usually have some rules to ensure the comfortable environment for cats and guests. 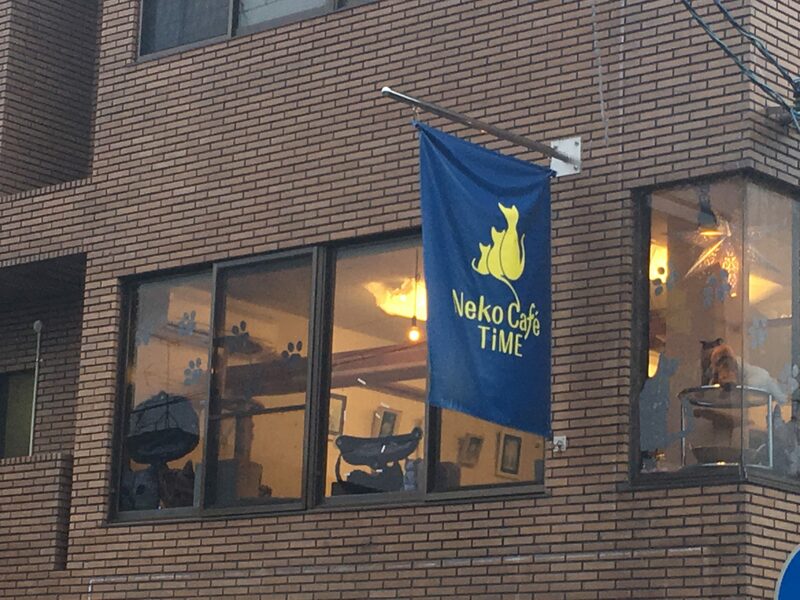 This is a must try experience if you are looking for a unique cafe experience in Japan, or if you are a cat lover. I’m happy to share with you the Top 5 best cat cafes in Kyoto! Cat Cafe Nekokaigi was opened in 2008, and it is the first cat cafe in Kyoto. This is a small cat cafe in the middle of Kyoto near the city hall with 12 rescued adult cats. Most cats are mixed breed. The owner wanted to have those cats because she wanted to prove that there are no difference between cats with pure blood and mixed breed cats. The cats are different characters, some timid,and some very friendly. You can pet them and sit down to let them climb on your lap. You can purchase treats for cat for ¥200. The cafe is so popular it tends to be full on weekends late afternoon so make it there early. To get there, you can take the Subway Tozai Line to Kyoto Shiyakushomae Station. This is a cat cafe conveniently located near the Fushimi Inari Grant Shrine. The Cafe has 13 cats with different characteristics. All the cats are abandoned and rescued cats from the street by the owner. The cafe is open from 10:30 to 18:30 everyday (the admission closes 30 minutes before the store closes). The Cafe is located between Fushimi Inari Station of the Keihan Line and Inari Station of the JR Line. This will be a perfect spot to take a break and play, after your visit to Fushimi Inari Shrine. 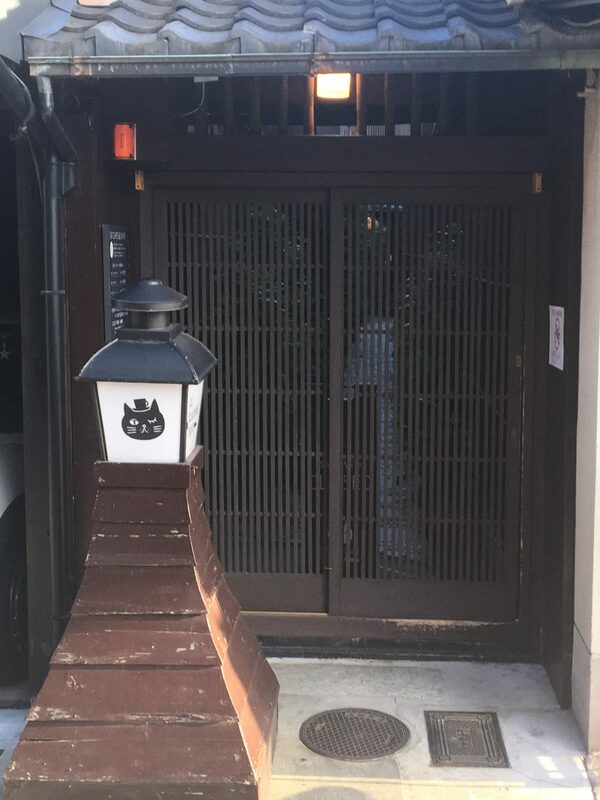 This cat cafe is a scenic Machiya (traditional wooden townhouse) style house of 100 years old, which itself is picturesque. The cafe really aims to allow their cats to live in freedom, thus the concept is focused more on admiring cats in their own surroundings rather than guests’ direct interactions with them. You are not allowed to pet the cats at will, the cats can come to you then you can touch the them. 13 cats here are “celebrities,” being extremely popular in SNS. Uni-chan, one of the most popular cats at this cafe,can stand up on their hind legs.It’s so cute!! You are discouraged from patting or holding cats unless the cats come onto your lap on their own. To get there, you can take City Bus #9 from Kyoto Station and get off at Ichijo Modoribashi, Seimei Jinja-Mae stop. Price:1,200 yen/60 minutes,1,700yen/90 minutes,2,100 yen/120 minutes. With additional 300 yen, you can add a drink, and for 600 yen, a drink and a home-made cheese cake. Next,let’s go to the cat cafe in the center of Kyoto! 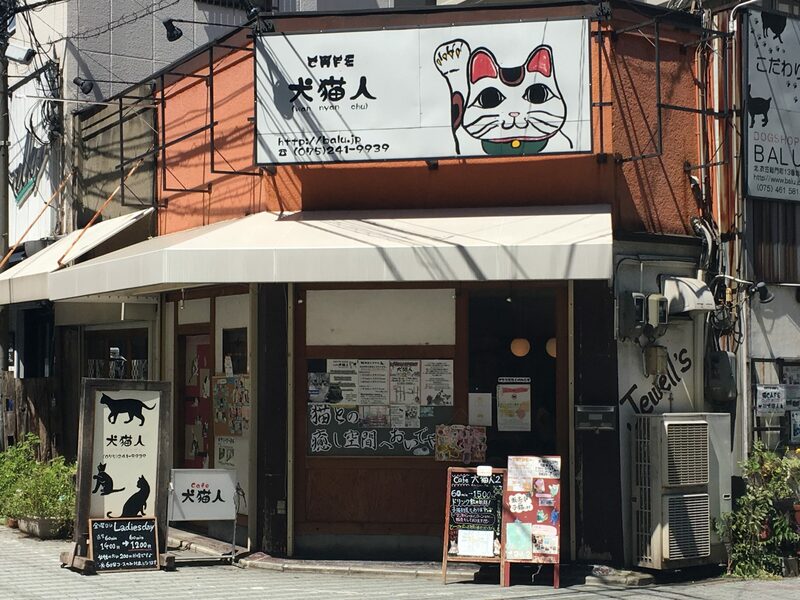 Cafe Wan Nyan Chu is conveniently located 5 minutes walk from Kawaramachi station. It is a cafe owned by a breeder, which means that it is full of cats of great breeds. It has two stores but Kawaramachi branch is located in Shinkyogoku, so you can take a break from your shopping at the cafe. You can interact with many kinds of cats including American Short hair,Scottish Fold and Russian Blue. You can purchase their foods and feed them.I recommend you to feed them if you want to play with them. The Kitten room is also available. Here is a video of Cafe Wan Nyan Chu. Open Hour:Weekdays 11:00〜19:00,Weekends 11:00〜20:00※The kittens room can be entered only until 15:30 (or 16:00 for weekends). Price:1,000 yen/30 minutes,1,400yen/60 minutes,1,800yen/90 minutes,2,500 yen/120 minutes. With additional 500 yen you can enter the kittens room. Others:One free drink is included with all courses. Children below high school age cannot enter the kitten room. Open Hour:Weekdays 12:00〜20:00,Weekends 12:00〜21:00※The kittens room can be entered only until 15:30 (or 16:00 for weekends). Price:1,500yen/60 minutes,1,800yen/90 minutes,2,200 yen/120 minutes. Others:One free drink and sweet is included with all courses. Marumari is a cat cafe in a residential area of Kyoto along a beautiful river, where you can interact with 12 cats including Tonkinese,Persian and Russian Blue. You can read books, watch TV, gently pat, or play with cats using toys provided by the Cafe. There are canned drinks you can purchase at the Cafe, though you don’t have to purchase. You can bring your own food and drink if you would like, but make sure you don’t feed those to cats. Treats for cats are available for free. The cafe is open from 12:00 to 19:00 except for Thursdays, though you can make a reservation (starting at the minimum of 2 persons for one hour) for Thursdays. Small children can enter with an accompanying adult, so this could be a perfect place for a family. You can take Eizan Railway to either Shugakuin Station, or Tamagaike Station. It is about a 6 minutes-walk from either of the two stations. Here is a video of Cat Cafe Marumari. 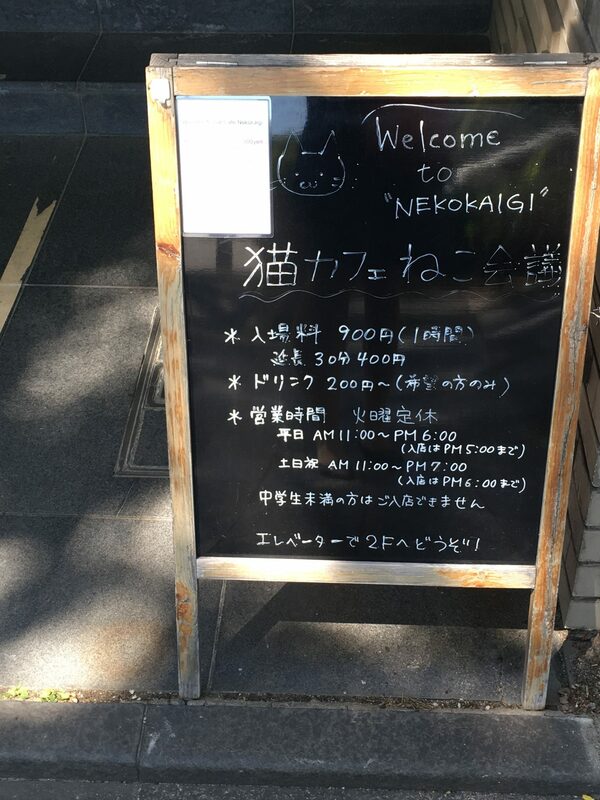 Cat Cafe Nekokaigi・・・You can pet the cats and sit down to let them climb on your lap. Neko Cafe TIME Fushimi Inari・・・ All the cats are abandoned and rescued cats from the street by the owner. Cafe Wan Nyan Chu・・・There are full of cats of great breeds..
Have a great time at cat cafes in Kyoto!